DutzWorks - Illustration and Graphic Design by Derrick Utz: Awesome meetings and a very thankful Captain! Awesome meetings and a very thankful Captain! This is cheesy for a reason! We geeked out like crazy! Hello all! I am sorry for the delay in posts since my last. I have been jumping around with a great deal of projects and meetings. This is one of the things I want to tell you all about today! I have been so very blessed to be able to spend time with a couple awesome creatives and inspirations of mine and I just have to share the awesomeness with you! First of, holy shnikies!!!!! A few weeks ago, one of my greatest teachers and a dear creative to me, Chris Oatley passed through Dallas on a long trip he was taking from California through other areas of the country. As I have mentioned before, Chris is a former Disney character designer but recently, he began his own online school for illustrators and digital painters called the Oatley Academy! Chris and the Academy were also just recently mentioned in "ImaginFX" magazine (Link here)! Great work Chris! Any time with a creative of Chris' caliber and experience is priceless and I am very appreciative that he gave it. I was able to join he and another artist, Jake Ekiss, who is local to my area for coffee and conversation that lasted for hours!!! It was amazing and we covered ground on everything from our current and future projects to the very fibers of what it means to be artists. I cannot tell you what it meant for me to discuss art with a man who has spent time building himself up to work with some of the greatest professional artists in the entertainment world today. Both Chris and Jake were a blast to be around and I look forward to future opportunities to spend time with such amazingly talented artists. Wow!! 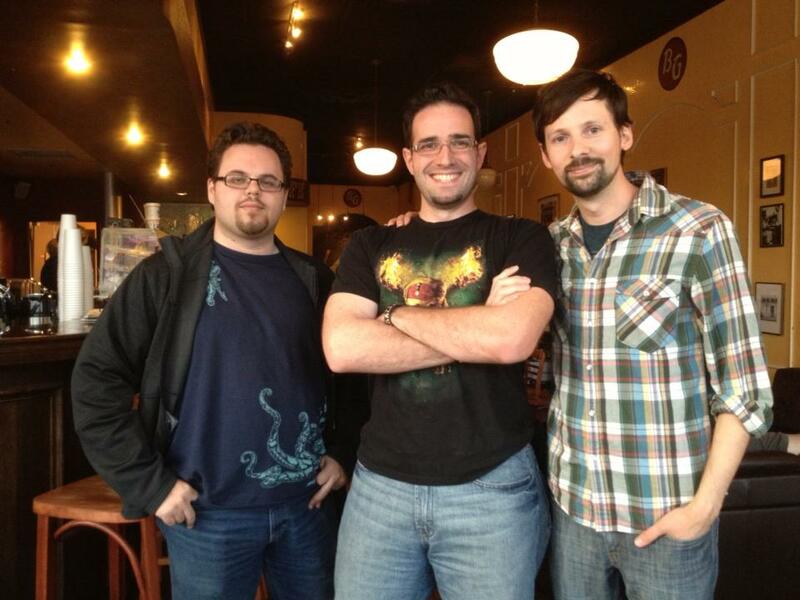 Here is the untouched photo of our awesome meet-up! 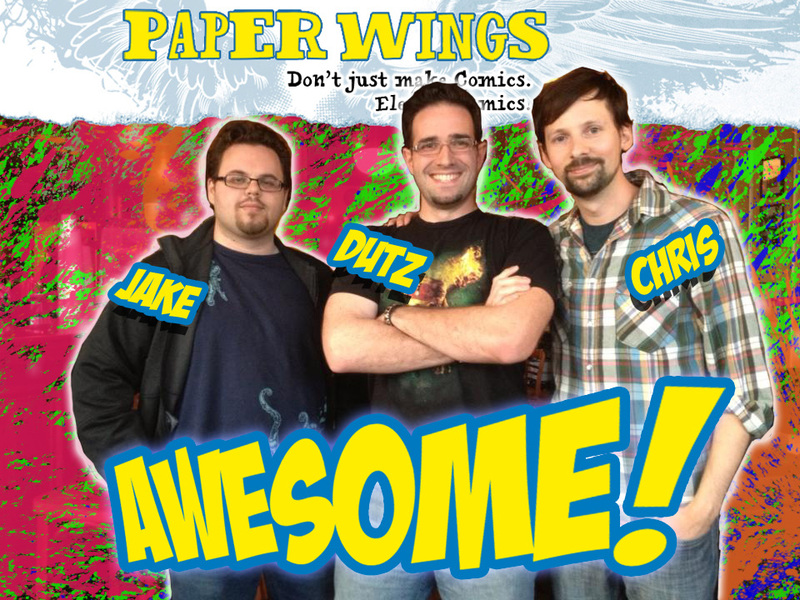 Paper Wings Podcast - A comic creation show hosted by Chris and co-host (and amazing artist/creator) Lora Innes! As if meeting with Chris wasn't enough, I additionally was graced with the opportunity to visit with the Creative Director for one of the most well-known and regarded marketing and design agencies here in Fort Worth! This has been a meeting in the making for a few months now because of our busy schedules and the great deal of responsibilities that Brandon ruthlessly tackles on a daily basis. I discovered the company a few months ago as I was searching for opportunities to improve my design skills. 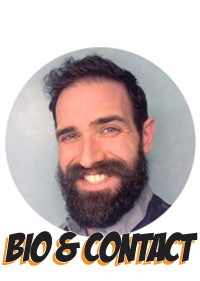 Many members of the team were able to connect with me both in emails and in person and it has been a great experience and honor to be met with such an amazingly willing regard. It speaks volumes to both the quality of the company and it's team members. Following some correspondence, Brandon and I were able to meet today over coffee and a custom portfolio I created especially for he and his team. In that 30 minutes I was handed one of the greatest gifts any professional creative should seek; perspective. He took time to study my material, laid out what he felt made me stand out from other artists and helped me to understand the traits and skills that I need to tackle and improve in the near future. You see, my professional goal is to grow both to the point that I am creating amazing quality design, and to eventually work with an energetic team on excited client's projects. Currently I work as a Graphic Designer in the role of a production artist because that is the seat my company needs filled. That is not how I see my talents and abilities being used in the future so I had a decision to make. I began to contact different companies in my local area to begin a discussion to simply learn how and where to grow my skills. This is to get me on track to meet my goals of being an asset to a team and lifesaver to clients who need a creative solution. Brandon understands this completely and has been willing, just as others within his company, to take time and invest knowledge into me. For this I am very grateful to all of them and I wish them the best as they improve the quality of design and communication across Fort Worth and all of the DFW Metroplex. Thank you! To adjust to the current tasks at hand, I am narrowing down the amout of personal projects I am handling. listed below are the new groups and I will keep you all "posted" on the progress as it happens. Bot's Amusement Park is going to be the main production project I will be working on. It will have the shortest "desk-to-publication" time of my current major projects. I am currently working on the development and exploration stages. My goal is to post the progress of "Indie-Man's Toolkit" ( my story and art planning tool ) to the site later this week. I will then use it to aid me in the development of both the story and art of Bot's to streamline my planning and writing process. The sketch art for this can be seen on my new facebook page so please take a visit if you want to see the doodles as I go! These are the projects that I am going to take on to improve my professional graphic design and visual problem solving skills. These exercises are going to be vital in aiding my growth into higher positions as a designer and professional creative. They will consist of designs based on real world and mock design briefs, promotional materials and editorial spreads. I am also working on getting started on a few sessions of continued education to refresh me and add to my current skill offerings. I am not trying to up my degree. I am actually just going to see if I can polish my current set since I have been out of school 5 years as of this month. Thankfully, my design college offers class audits to it's graduates. This, combined with a new list (thanks to Brandon) of websites and periodicals, will help me become the "Design Superhero" I am determined to be!!!! Sounds like your on a roll Dutz! Look forward to seeing more! Yes, I am trying to get the ball rolling on upgrading my work and growth potential so I have some really awesome stuff ahead! I will keep you posted as I get through some of the exercises! Also, if you jump onto the Facebook and "like" it you will be included in the updates and sketch outs I will be doing. It was great hanging out with you, buddy. Hope we get to do hang out again soon! Thank you so much for stopping by here and for the awesome art chat! I too cannot wait to get to geek out again!